In our tamed, modern civilization, it is difficult to come upon wildlife that is not far removed from cities and settlements. At this point, most people can only see animals in zoos, at least those that are not in the household pet category. Birds are the exception to this rule. Because of their ability of flight, they form their lively communities even in highly urbanized zones. Still, your best chance to take a peak into the last vestiges of free-form bird wildlife is in smaller towns, suburbs, and villages. Birds play a vital part in our ecological system, especially when it comes to pollination and insect control. Therefore, their health is in our best interest. So whether you engage in birdwatching for recreational or professional reasons, you would be amiss to assume that any old equipment would do the job. In fact, many people who want to engage in birdwatching give up because they think they are not good enough to fully appreciate it, without even crossing their minds that the problem might lie in the equipment they use, namely the proper type of binoculars. Birds are swift and lively creatures, often possessing natural camouflage that lets them blend in their natural habitat in order to avoid predators. When you take those factors into account, you soon realize that a ‘bird-worthy’ binoculars also must be in line with the nature of the object you are going to view on a regular basis. Must be sharp enough to allow for fine detail to be easily discerned. Must be bright enough to show subtle differentiation of detail in poor lighting conditions. Must allow for a quick focus, for obvious reasons. Must have a wide field of view, which is directly linked to quick focus. Those two factors are essential for locating and tracking fast-moving birds. Must have precision color rendition, without any distortions, especially in the center of the field. Must provide some kind of ventilation, so they don’t fog up in humid weather conditions. If an enclosed VR headset can do this, so can binoculars. Must be comfortable enough to work with eyeglasses. Now that we have listed what is required from binoculars in order to offer you a pleasant and effective birdwatching experience, we must see how those features are reflected in actual products you can buy, and what is the terminology used by manufacturers to reflect those requirements and features. Of course, when you go to a store, be it physical or online, you will quickly see that the depiction of binoculars is centered around a couple of measures by which they are marketed as superior or inferior, appropriate or inappropriate. The first of these measures you will see in any binocular description is something like 10×25, which is read as “ten by twenty-five”. The first number – 10 – denotes magnification (how many times can object be enlarged), and the second number – 25 – denotes the diameter of the lenses in millimeters. So, a 10×25 binoculars will enlarge your view by ten times, through 25 mm wide lenses. Based on these basic numbers, you can be sure of a couple of things. Binoculars over 40mm will regularly be bulky, but offer the clearest and most accurate vision, even in poor lighting conditions. And the smaller you go, these necessary binocular features for birdwatching will decrease. So, this is your first decision in compromise – do you want large binoculars but uncompromising visual acuity most suited for bird watching, or do you want compact binoculars that somewhat sacrifice this quality, but which you can carry effortlessly and are the size of the palm of your hand. Only you can decide which suits you do best, just be certain that the compromise will be worth it. However, keep in mind that if you are a beginner in birdwatching, then you will need all the detail your eyes can physically take in, and that can only be accomplished with 40-45mm binoculars. Larger binoculars will regularly satisfy the aforementioned requirements for birdwatching. One would think that the more magnification you can get the better you are off. After all, binoculars serve to ‘augment’ your own eyes. This is not necessarily the case with birdwatching binoculars, as the higher the magnification you get, the more movement magnification you get as well. Unless you can hold your hands perfectly still, which is impossible because you are not a robot, you will soon realize that even a slight motion will greatly detract from your ability to locate and track birds. Everything will become shaky and blurry, requiring intense mental focus to discern what is going on, which will become very tiring, very quickly. Keeping that in mind, you should not go over 8 times magnification for birdwatching, but if you think it is necessary, you should absolutely go for binoculars which have the Image Stabilization (IS) feature. In fact, it would be wise to always pick binoculars with IS feature, but they are usually more expensive. So, it is another compromise decision you must make. If you are already familiar with FPS games and VR headsets, you know the importance of FoV – Field of View. There is a huge difference between watching something through a small tube, or watching it through a tube where you barely see the edges, thus drastically increasing your ability to fully immerse yourself in the content you are observing, that is, quickly able to find and track birds. Diameter of the field you see from a 1000-yard distance. Angle of the view. For birdwatching you should get an angle of at least 6.5 degrees. Obviously, the higher these numbers, the better your FoV will be. If you need to convert angle to the size of the view field at 1000 yards, simply multiple the angle degree with 52.5. Respectively, if you want to convert view field to angle degree, divide it by that same number. Once you get settled on these three (or four if you include the super useful IS) fundamental features, other features will become a matter of how high do you want to go within the price range: if they are waterproof or nitrogen-purged so they can’t fog up, what kind of kit are they bundled with, do they come with eyecups if you are wearing eyeglasses, and so on. The only other must-have consideration that is not price-dependent should be a single focusing knob instead of a separate focus adjustment, as those kind of binoculars are too sluggish for enjoyable birdwatching. Although there is something to be said about the uncompromising field of view and larger magnification of bulkier binoculars, the convenience and ease of use of compact binoculars cannot be overstated. And Aurosports binoculars is as compact as you can get without compromising too much on visual acuity – literally fitting the palm of your hand when fully folded. Sporting 10x magnification and 25mm lens, Aurosports is being marketed as your go-to binoculars for viewing sporting events, bird watching, concerts, and hunting. Its small size is certainly suitable for all of those activities, but the 6.9 degree field angle is more than sufficient enough to backup those claims, as at least 6.5 degree angle of view is recommended for comfortable birdwatching. 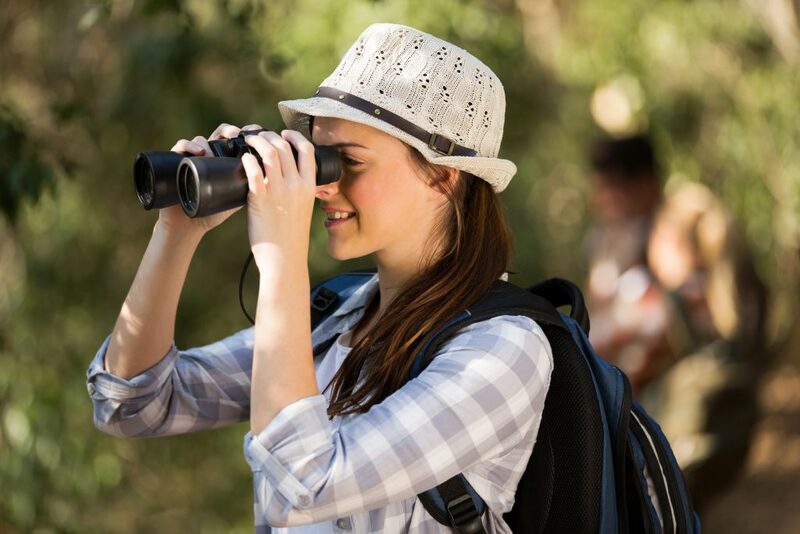 Remember, birdwatching should be the standard upon which you should judge a binocular, because it is an easy job to view stationary objects, but not so much when it comes to rapid objects like birds, which then also translates to sporting events and hunting as well. Multi-coated lenses which allow for clearer vision in all lighting conditions. Extra accessories for the price. No strap for the neck, only for the belt. The magnification could be higher, as they are not the smallest binoculars on the market. But for the price and features offered, Aurosports binoculars is an ideal gift for yourself and others, including kids. Even smaller than Aurosports, the Skygenius binoculars sacrifice in magnification and lens size even further, only offering 8x times magnification with 21mm lenses. As they are primarily marketed as concert theater binoculars, this should give you a clue that they are far from ideally suited for viewing distant and rapidly moving objects like birds. It really comes down to your needs, as 8x times magnification is not as high as it might seem. After all, most smartphones with integrated tiny cameras offer a 10x digital zoom, so you should keep that comparison in mind. Multicoated lensing, tiny size, and slightly better viewing experience are the features that should elevate the Skygenius above just using your smartphone’s camera. Multi-coated lenses for clear viewing, along with the inclusion of BK7 prism glass. Robust manufacturing quality – it will last you for a long time. Perfectly suited for beginners and as a backup binoculars sitting in the glove compartment of your car, Skygenius binoculars are nonetheless among the top binoculars to select if you are looking for its three most prominent features – price, size, and high build quality. If you want to fully immerse yourself in the content you are viewing from a safe distance, then you can hardly get any better than with the extra-large 50mm lenses offered by Bushnell Falcon. Combined with the 10x magnification and auto focusing Porro prism, the Bushnell Falcon represent the entry to higher-grade binoculars. Weighing at hefty 27oz (765g), you should not expect them to be easy to carry around for longer periods of time, but what you should expect is not thinking that the viewing experience could be better with anything other than a high-grade bulky telescope. Large, uncompromising, fully coated lenses. All the accessories you would need, including eyecups for people wearing prescription glasses. Robust, rubberized finish, making them suitable to use in rough conditions. For the size and weight, magnification could have been higher. Overall, it’s hard to find binoculars with a better viewing experience than Bushnell Falcon, for the price asked. 50mm lenses offer an exceptionally large field of view, which allows you to easily acquire and track any object. And when you add auto-focusing prism and fully coated lenses, you get an extra layer of visual acuity. Although not as compact as some other models, once you strap them on your neck, you get used to them fairly quickly. All versions are available in either classic black or sandy brown camo color scheme. When it comes to Bushnell you can expect high durability and high quality of optics, as you won’t find substandard optics in any of their lineups, and Powerview series is no exception. Although all are compact, the 8x 21mm will be ideally suited for concerts and opera viewing, while larger ones will be more suited for outdoor activities like hunting and birdwatching. Remember that with larger lenses, it will be easier to handle viewing fast-moving objects like birds, so 10x 32mm and 16x 32mm models would be best for those. However, keep in mind that larger magnification also increases the slight motion of your hands so, depending on your intended environment, lower magnification but larger lens size might prove to be more useful. Bushnell high standard when it comes to optics – all models have fully coated lenses. Could have had more color schemes? Powerview lineup of foldable binoculars was a great idea. It offers compact sizes and light weight, while not diminishing too much in terms of lens sizes and magnification. A great selection of binoculars for everyone! Relatively new in the optics scene, Gosky managed to gain reputation of offering higher quality products at a still reasonable price. Their 10×42 binoculars have a modern, sleek design, departing from the traditional binocular design of emphasizing the lenses. The 42mm lenses are just the right size to bring into 10x focus a wide range of activities – from birdwatching to viewing concerts and sporting events. Although it weighs at 1.54 lbs, the size is quite comfortable, just at the edge of leaving the compact category. Exceptional build quality, suitable for the harshest environments and climates. With Gosky binoculars you are entering the high-end market of binoculars and this is reflected in its price. However, if you want superb binoculars that will last you a life-time, it will be difficult to find a more compelling offer. Furthermore, the latest version has a smartphone mount for the lens, so it is fully integrated into the 21 century, allowing you to capture, in video and photos, everything you desire with great clarity.